The quest to visualize cells is a long and continuously evolving one. We have previously discussed how neuroscientists use calcium to watch cells in action, but a surprising amount of information can be gleaned from simply staining fixed (inactive) cells. There are so many ways to stain fixed cells that I have to write this in parts. First we'll discuss two of the oldest techniques still commonly used, the Nissl stain and the Golgi stain. 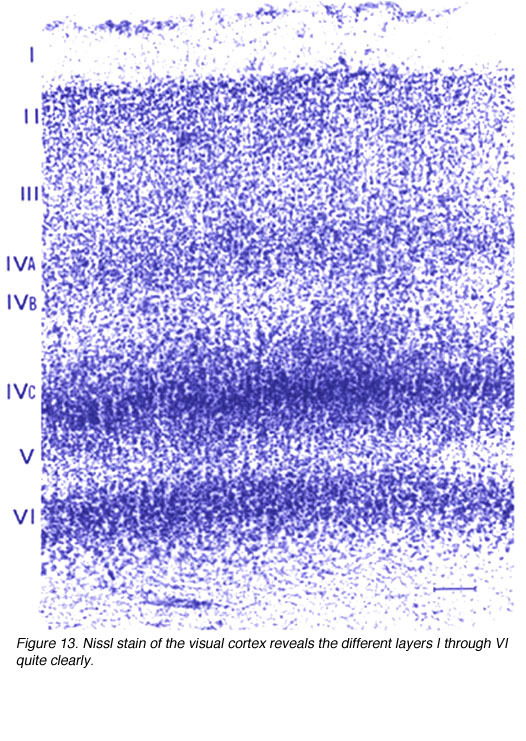 One of the earliest techniques to allow for the visualization of neurons is the Nissl Stain. The Nissl stain colors the cell (purple if you are using cresyl violet) because it reacts with nucleic acids (which make up DNA and RNA) in the nucleus of the cell and in the endoplasmic reticulum. 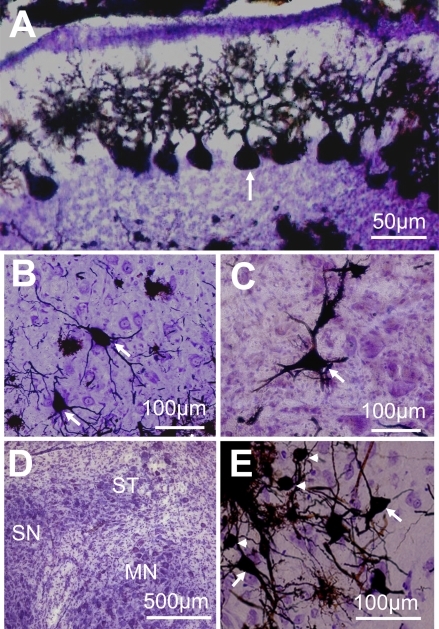 The Nissl stain reacts with most of the cells in a brain slice (both neurons and glial cells), so it is not great for seeing the detailed morphology of a single neuron. 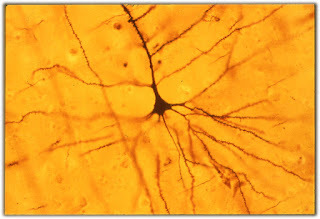 However, it is great for seeing the cellular patterns of a particular brain area. The image above clearly shows the different layers of the visual cortex. Layer 1 has almost no cells, but layer 4 has tons. 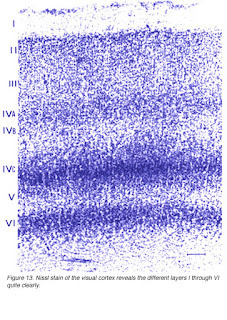 This technique can be used to visualize the results of a certain mutation or drug treatment on the brain. It is often also used as a control experiment to confirm that a treatment did not kill cells or damage the brain. In contrast to the Nissl stain which stains almost all the cells, the Golgi stain impregnates only a few of them. The Golgi stain works by starting a silver chromate reaction in random cells. It is not known why a certain cell would undergo the reaction while a cell right next to it would not. The result is that the morphology of the cells can be clearly seen without contamination from nearby dendrites from other cells. 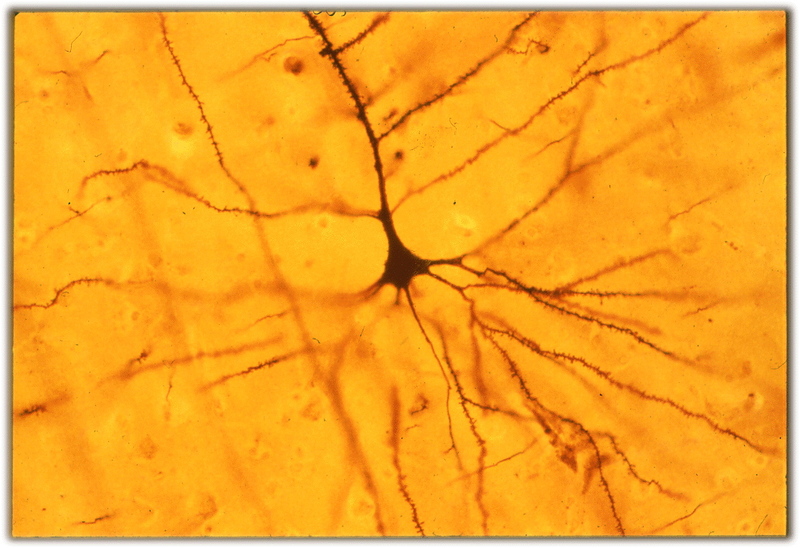 This technique can be used to test whether a mutation or drug treatment alters the growth of cell dendrites. A group at Leicester University in the UK has developed a protocol that combines the Nissl and Golgi stains, so you can have the best of both worlds. 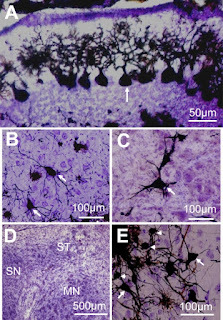 Using this technique, they were able to more accurately characterize the morphology of neurons in specific areas of the brain. They also found that the Nissl stain underestimates the soma size compared to the Golgi stain.